Immediate comfort and extended tear film protection. Immediate comfort and extended protection for Dry Eye due to insufficient quantity or quality of natural tears. Working with your natural tears, provides immediate comfort and relief of Dry Eye symptoms. Preserved with POLYQUAD (polyquaternium-1) 0.001% w/v. Also contains aminomethylpropanol, boric acid, hydroxypropyl guar, polyethylene glycol 400, potassium chloride, propylene glycol, purified water, sodium chloride, sorbitol. May contain hydrochloric acid and/or sodium hydroxide to adjust pH. Shake well and instill 1 or 2 drops in the affected eye(s) as needed. Do not use if seal is damaged or missing at time of purchase. Keep carton for future reference. Do not use if this product changes colour or becomes cloudy, or if you are sensitive to any ingredient in this product. Do not touch tip of container to any surface to avoid contamination. Replace cap after each use. If you experience eye pain, changes in vision, continued redness or irritation of the eye(s), or if condition worsens or persists for more than 72 hours. Love this product but not in Gel form. Doctor recommended it when I was getting eye infections during chemo. My eyes remained sensitive after so I continue using this product. I have been using it for 3 years now. I have chronically dry eyes, apparently common to people who had the old style of PRK laser eye surgery. I find many drops are either too goopy and make a film on my eye or they wear off too quickly. I have tried several different products and now always buy this one because I find it provides the right combination of consistency and effectiveness for my eyes. The price is comparable to a product I used to purchase from my optometrist. Systane works like a charm. What a relief! 5/5. 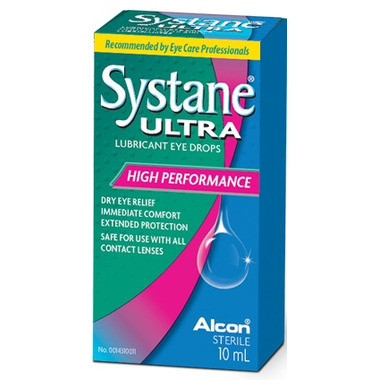 This product was recommended by my eye doctor as I get VERY dry eyes. I love this product and have found it to be the best on the market. My eyes are very sensitive and this product its not suitable for my eye i will go see my doctor and the price are way high. This product was recommended by my eye doctor and is very effective for anyone with very dry, red eyes. the product is very effective and for this type of product quite long lasting. Our first experience with it was when both my husband & I got new glasses & because my husband & I both have relatively dry eyes, we were given a sample of the product. Well I find I only use it once or twice a week and that is quite sufficient. My husband uses it 3 or 4 times a week. Guess his eyes are drier. We both find it immediately effective, and as well the dropper easily dispenses only 1 small drop at at time, meaning you are not wasting any, and the bottle lasts as long as possible.